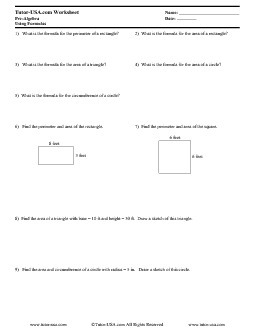 This Free Pre-Algebra Worksheet contains problems on using formulas to solve problems. Students must recognize formulas for rectangles, circles, and triangles and evaluate formulas for given variables. 1) What is the formula for the perimeter of a rectangle? 2) What is the formula for the area of a rectangle? 3) What is the formula for the area of a triangle? 4) What is the formula for the area of a circle? 5) What is the formula for the circumference of a circle? 6) Find the perimeter and area of the rectangle. 7) Find the perimeter and area of the square. 8) Find the area of a triangle with base = 10 ft and height = 30 ft. Draw a sketch of this triangle. 3) The formula D =1.5 x (s + s2 ) ÷ 20 is used to determine the approximate distance is takes a car to stop when traveling on a wet road. If a car is traveling at 15 mph on a wet road, find its stopping distance.